Because it's an awful movie that teaches little girls to change their identity to please their peers, that's why! There are very few advantages for a summer-phobe such as myself to living in a perpetual oven like Perth. If the definition of 'advantage' was sufficiently loose then I might be able to point to the frequent opportunity for dusk and night time leisure rides. 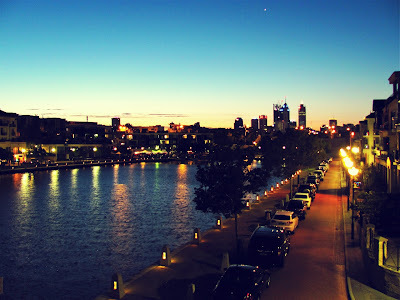 During our especially foolish experiments with daylight savings, Perth was also in the grips of an unbearable summer. Even after the sun set, the heat of the day would linger. And linger. 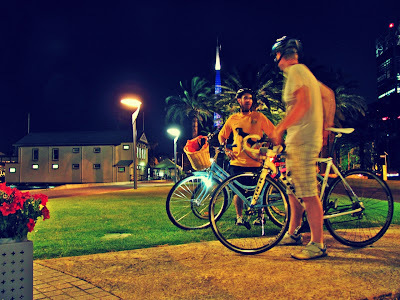 Though dark, the air was still hot and any movement produced rivers of sweat; but being outside and on a bicycle meant creating your own breeze so we soon took to riding the East Perth path in the evenings. It was a cooler way to exercise without having to pay for the pool seven nights a week. Fraser's Point cycleway just past East Perth includes some boardwalks. 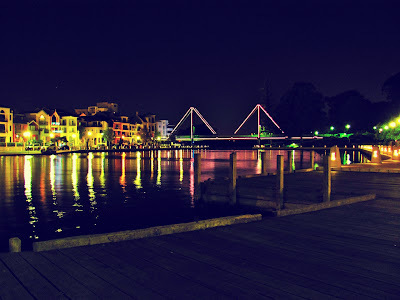 Living right next to the start of the East Perth bicycle path made these night time jaunts close to ideal in terms of getting some summer recreation. The protection from cars and the well lit, smooth surfaces allowed us to go as fast or slow as we wished according to the temperature. Best of all, at the East Perth end was a pretty view of the city and river, twinkling lights and bars or cafés to enjoy refreshment. I was able to do many solo rides along the path when Ginger was working late as it's a safe and predictable environment, though I did avoid doing anything other than cycling on the bike - on such a sheltered path, listening to music is tempting but I prefer to hear potential hazards as well as see them. I did take an iPod shuffle with me once but only because Ginger was riding behind me. He tried music once when I was behind him but we both concluded that we didn't feel comfortable bicycling in a cocoon of sound. Jogging or walking is slow enough that potential hazards see you even if you don't see them. The bike at full speed can still suffer from an element of surprise. View from the East Perth bridge. 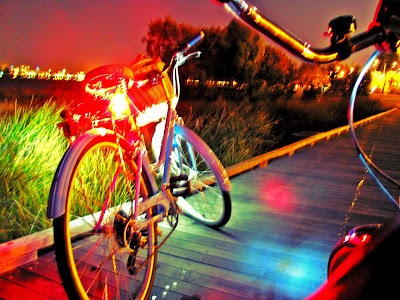 Through the summer, as our bicycle enthusiasm spread to our circle of friends, we even did some social night time rides. On my very first ride with a friend, the chain on the Schwinn Jenny popped off shifting out of 4th gear (it was my fault, I accidentally flicked multiple gears and simultaneously put power through the crank and it hadn't had its complimentary service where everything gets 'tightened up'. Never had a problem since.). We weren't very far into our ride and I was at that time ignorant of the ease with which a chain on a derailleur is wrestled back into position. Being the tail end of Roadie Rush Hour, a be-lycraed, pleasant stranger responded to my flagging him down and proceeded to make me feel very foolish by fixing my chain in about one and a half seconds. For the record: Push derailleur forward with one hand, rehook chain with other (this will be a bit greasy with a chain guard to get around), turn cranks by hand until it clicks into place. Mind numbingly, embarrassingly simple once you see somebody else do it. Which is why I am still looking for a simple bicycle maintenance course. Though a few of our friends caught bicycle fever and bought bikes of their own, having more than one bicycle each allowed us to invite friends who didn't own bicycles and we spent quite a few pleasant evenings cycling along the foreshore or to a café strip or music venue. The paths were all but abandoned after rush hour and have excellent distance visibility so we could ride two-abreast at a leisurely pace, conversing and relaxing. One friend hadn't been on a bicycle for years and wondered aloud how she would manage. After cycling half of the East Perth path to Mt Lawley, on the return trip she proceeded to put a bag of hot chips in the Schwinn Jenny's front basket and cycle home one-handed while scoffing potato. The Schwinns do an excellent job of being 'loaner' bikes because their gears are so intuitive, posture so relaxed and their handling requires only rudimentary bike skills. Nothing compensates for a bit of summer sweat like knowing there's a watermelon and mint cocktail at the end of it. Just one, though - No drinking and biking! 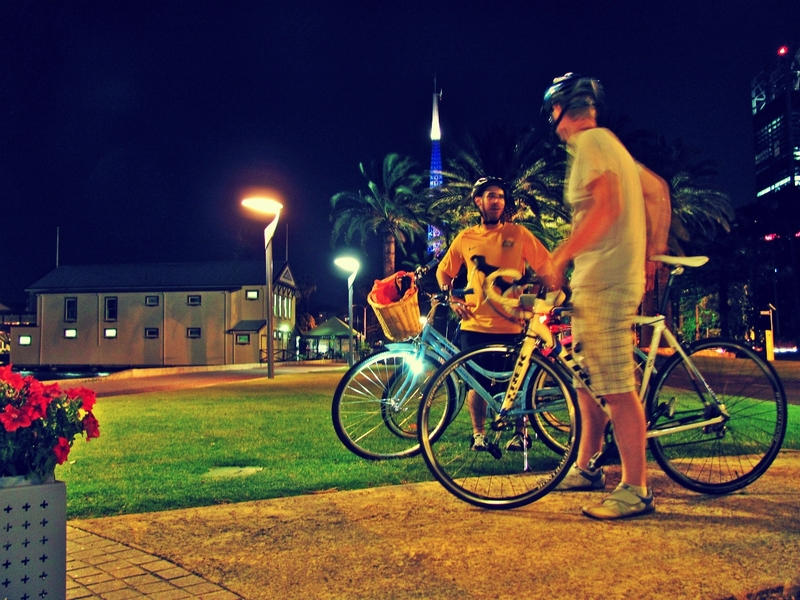 I do miss the security and convenience of the East Perth path, it was perfect for those spontaneous summer rides, day or night. But I won't miss always having to blot my face with tissues when arriving at my destination. Sweaty bike friends stop at the jetty.